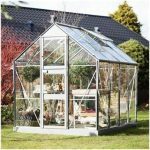 This is a good looking neat greenhouse which is ideal if you are limited in space. 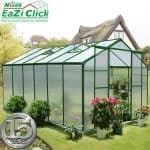 It has polycarbonate glazing and a thick extruded resin frame which is better than aluminium. 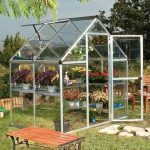 There is plenty of good ventilation and temperature control meaning your plants and seedlings are well protected from the elements. There is good work space inside too, a great first greenhouse. This product is home delivered. I am extremely disappointed with this greenhouse. The quality of the material used and its longevity is very poor. The polycarbonate glazing is not at all durable. The UV rays caused it to get disintegrated with few months and they are in the verge of collapsing. 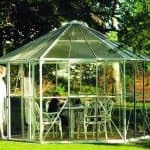 The instructions for assembling this greenhouse are terrible. I had to work on it for 5 hours to make it stand. 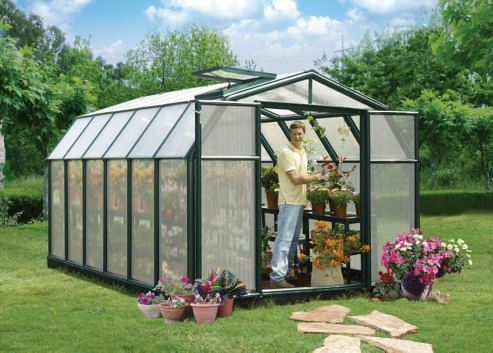 Moreover, the size of the greenhouse is quite bigger than it was mentioned in the brochure. This is a problem for me as I have limited space in my backyard and now it is placed in a very awkward position. 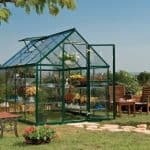 Also the price of this greenhouse is way too much compared to its quality and service. I am tremendously dismayed with my greenhouse.